A bill banning fees charged in the private rented sector passes the final stage. Senedd Live returns on Tuesday 2 April. The topic chosen for the Short Debate by independent AM Neil McEvoy (South Wales Central) is "Children’s services: time for change". He says "changes are needed to ensure children’s services are protecting Wales’s children in the best way". AMs approve the Renting Homes (Fees etc.) (Wales) Bill. There were 42 for, no abstentions and one against. Julie James says she intends the bill to be enacted by the autumn. Minister for International Relations and the Welsh Language, Eluned Morgan says the UKIP motion fails to address the current "chaos" surrounding Brexit. 1.Notes that the European Union and its predecessor has been a positive force for continued peace and stability in Europe since its foundation. 3. Believes that whatever the outcome of the current negotiations, the United Kingdom should seek to maintain the closest possible economic, social and environmental links between the UK and the other 27 states which make up the EU. Former minister Alun Davies condemns abuse of politicians, and says that police officers have been to his home following threats made to his partner, Labour MP for Cardiff North Anna McMorrin. Mark Reckless, a former UKIP AM who now sits with the Conservative group, says that in the Siambr he has been "attacked" and told that he was a "visitor" in Wales, and called a "liar". "That is not how a Parliament should operate," he says. Plaid Cymru leader Adam Price says that Article 50 "should be extended for up to 21 months so that a people’s vote can be held to allow the people to decide whether to approve the negotiated Withdrawal Agreement or remain in the EU", and calls on the Welsh Government to make a statement to the Assembly "detailing the steps they have taken to prepare for a people’s vote and what representations they have made to the UK Government to this effect". Conservative Darren Millar says that the outcome of the referendum on the United Kingdom’s membership of the European Union must be respected and that the decision to leave should be implemented. AS MPs are debating the "indicative votes" on alternative Brexit options, the topic chosen for the UKIP debate is the European Union. 1. Notes that the Treaty on the European Union commits member states to progress towards an ever closer union among the peoples of Europe. 2. Regrets that, since 1973, the EU has taken power away from elected national parliaments, and concentrated it in the hands of unelected EU institutions. 3. Notes the erosion of national vetoes in favour of majority voting in the Council of Ministers, in an expanding number of policy areas, and that this trend will continue indefinitely. 4. Believes that the ongoing uncertainty of negotiations between the EU and United Kingdom create a danger that the United Kingdom will remain within the European Union, contrary to the decided will of the people as expressed in the 2016 referendum result. 5. Believes that the European project is a relentless force, promoted by the EU’s permanent institutions, notably the Commission,and that the risks of remaining within the EU include becoming subject to a European army, further economic integration and erosion of the United Kingdom’s sovereignty. 6. Calls on the UK Government to focus all efforts on reaching a free trade agreement with the EU as swiftly as possible, to facilitate a full and unimpeded exit from the European Union. Notes that council tax levels for band D properties in Wales are on average lower than those in England. Recognises that the funding formula for Welsh local authorities is reviewed annually through a partnership between Welsh local government and Welsh Government. Plaid Cymru's Dai Lloyd calls on the Welsh Government to "consult on a long-term funding settlement for local government which would allow for longer term planning for local government," and to "reduce the number of hypothecated grants in order to allow for greater flexibility on spending of grants by local government". The party calls on AMs to recognise that "council taxes have risen due to austerity implemented by Westminster and lack of priority for local government by the Welsh Government when formulating the budget," and to recognise "the important link between NHS and local government in the delivery of services". The topic chosen for the Welsh Conservatives debate is local government funding. Dafydd Elis-Thomas, Deputy Minister for Culture, Sport and Tourism, says it is not for the Welsh Government to tell the WRU how to run rugby in Wales. The vote is deferred until the end of plenary. The motion has cross-party support, with Labour, Plaid Cymru and Conservatives backing it. UKIP is conspicuous by its absence on the list of co-submitters and supporters. The topic chosen for the Member Debate under Standing Order 11.21(iv) is rugby. d) the strong concerns voiced by fans regarding a potential merger of the Ospreys and Scarlets’ regions. 2. Calls on the Welsh Government to work with the Welsh Rugby Union and regional/club partners to protect rugby in Wales and develop a sustainable long-term model for the game at a regional and grassroots level. Former minister Alun Davies says "this place may need to take control of this process if the government is unable to do so". He also calls for the separate leak inquiry to be published. He concludes, “would the government consider bringing a motion to this place with the terms of the inquiry, with the form of operation of the inquiry so that all of us may be satisfied, and satisfied in public that this inquiry is the open and transparent process that the family were promised, that this inquiry will operate in a way which searches for the truth and doesn’t operate with either favour or fear for anyone, and ensures that we are able collectively to ensure truth is brought out, and ensures people are able to understand what happened to our friend and understand why that happened. “Given the judgement today it is time now for the government either to take responsibility for resolving this and do so very very urgently, or it is time for this place to do that for the government." Plaid Cymru leader Adam Price describes the High Court ruling as "a very serious blow indeed to the Welsh Government's reputation for honesty and integrity". 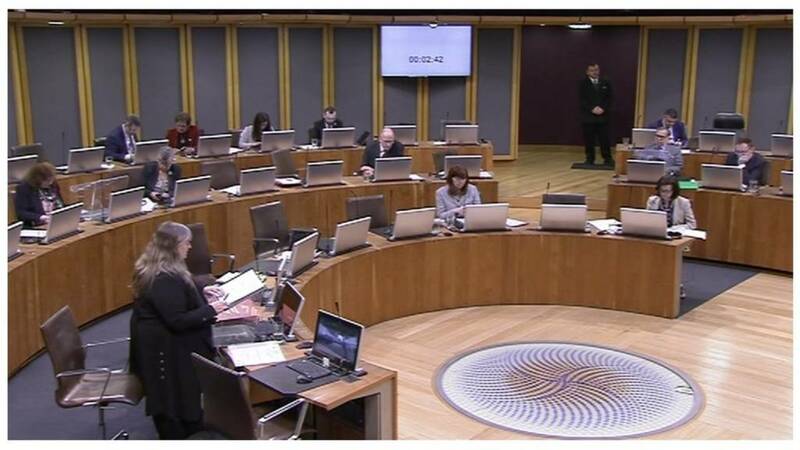 Rebecca Evans, Minister for Finance and Trefnydd, thanks the court for "providing clarity on what has been a complex process". She says the Welsh Government would "consider the next steps" in light of the judgement. Andrew RT Davies (South Wales Central) asks: Will the First Minister make a statement in response to today’s High Court’s decision regarding the QC-led inquiry into the dismissal of Carl Sargeant? It was unlawful when Carwyn Jones took decisions on an investigation into his sacking of a minister accused of sexual misconduct, the High Court has ruled. Carl Sargeant was found dead at his Connah's Quay home four days after the then-first minister dismissed him in November 2017. The late AM's family challenged the legality of the inquiry process. Mr Davies says “this is a damning judgement and the family deserve far better from us as an institution and you as a government”. AMs approve the draft Partnership Arrangements and Population Assessments (Miscellaneous Amendments) (Wales) Regulations 2019. • Change the names of the regional partnership boards affected by this health board boundary change to reflect the new names of the Swansea Bay and Cwm Taf Morgannwg health boards.